PHOENIX — Arizona’s bald eagle population continues to soar as the number of breeding areas expanded statewide and a record 82 young hatched during the 2017 breeding season, according to an annual Arizona Game and Fish Department survey. While the number of hatchlings rose from the previous high of 79 in 2016, the number of young that actually fledged dipped slightly to 63 birds that made the important milestone of their first flight. In Arizona, at least 95 eggs were laid, which was slightly less than the 97 laid in 2016, and a record 85 breeding areas were identified, including two new areas. Arizona’s bald eagle populations have flourished since 1978, when 11 pairs were counted within the state and the species was listed as endangered. Today there are an estimated 67 adult breeding pairs. Bald eagles in Arizona were removed from the federal Endangered Species Act in 2011. The department’s conservation efforts contributed to the species recovery. 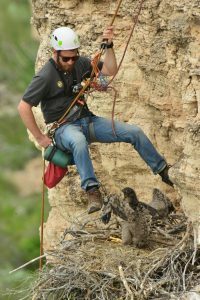 Nationally, the birds remain protected by the Bald and Golden Eagle Protection Act. Continued support from the committee, State Wildlife Grants and the Heritage Fund (Arizona Lottery ticket sales), will help ensure that Arizona’s bald eagles continue to thrive.